Con Wager, Asa Moore & Ned Wilson were lynched in 1868 by the “Committee of Vigilance.” The three had intimidated many ranchers to sign over the deeds to their ranches. Asa “Ace” Moore, Con Wagner (a.k.a. 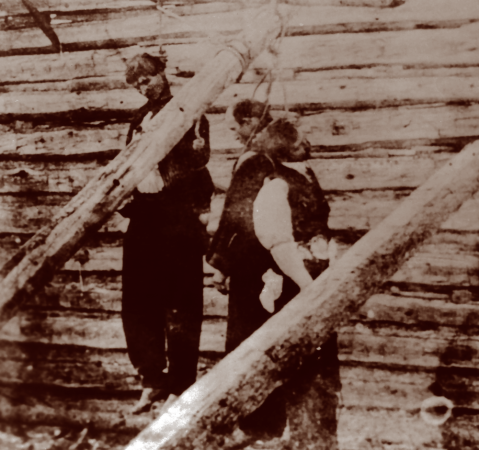 Con Moore), and an individual known as “Big Ned” or “Big Ed” Bernard were hanged in 1868 for their part in unlawful and violent acts against area ranchers. Their leader was “Big” Steve Long, a gunfighter who had been elected deputy marshal of Laramie during its early lawless days at a time when even the newly elected mayor and other government officials resigned within six weeks of each other in 1868. Long was a violent man who intimidated, robbed and killed many honest men. He and Moyer and Wagner, owners of the Belle of the West Saloon– forced several ranchers to sign over the deeds to their ranches. Many who protested ended up dead, but with no witnesses to the crime. Finally, N.K. Boswell, a local rancher and later the first sheriff of Albany County (1869), organized several other ranchers to conspire against the three. Their determination resulted in the hangings of Moyer, Wagner, “Big Ned” and eventually “Big” Steve. Learn more about how the “Committee of Vigilance” brought Laramie back under control.